From Oregon quarterback Marcus Mariota winning the Heisman Trophy to playing in the College Football Playoff for a chance at a national championship, Oregon football has officially gained status among the college football elite. According to ESPN’s Ivan Maisel, the years of steady program building starting with head coaches Rich Brooks and Mike Bellotti are paying big dividends, positioning the Ducks with an opportunity to realize their dream of top tier status with a victory in the Rose Bowl against Florida State and to define a legacy roughly 20 years in the making. The old guard football elite aren’t friendly to newcomers. 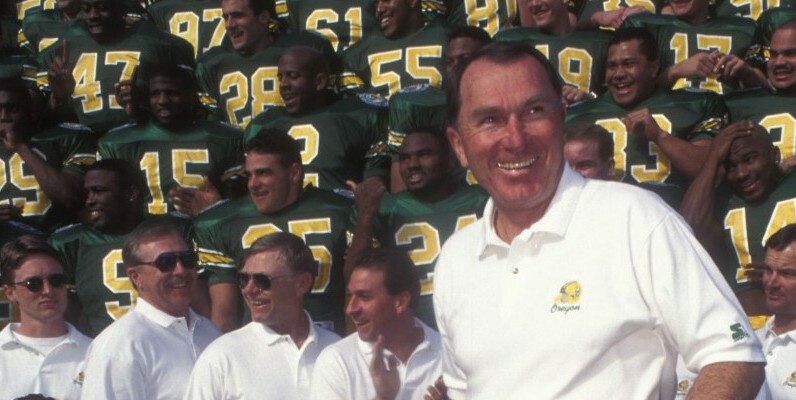 But when a determined Brooks got Oregon to a Rose Bowl in 1995, squaring off against Joe Paterno’s infamous Penn State team, win or lose, it was the beginning of a new era for the Ducks. 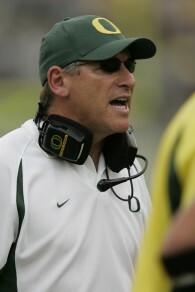 Oregon achieved gridiron success without the resources other powerhouse programs were afforded. For many years, the Ducks often lost recruiting battles to big name schools. But the coaches squeezed blood from a stone, working that much harder to develop the athletes they had and to transform them into top performers. The program has come a long way. Could anyone have imagined the Hatfield-Dowlin Complex, Oregon’s luxurious football headquarters that serves as the team’s Football Operations Center? Probably not. But Oregon’s success is more than glass buildings, infinity pools, and flashy uniforms. This small-town football program was built with years of sweat equity. Despite numerous coaching changes and roster overhauls, the program has continued to rise in the rankings, winning four Pac-12 Championships in the last six years, driven by the “Win the Day” philosophy that players and fans alike have come to embrace. The Ducks have achieved unprecedented success thanks to the tireless work of the athletic department, coaching staff, and university administration, and the tremendous support of fans and alumni, chief amongst them Phil and Penny Knight. Many Ducks supporters have remained loyal through the lows and the near misses. Oregon has remained true to its core values of integrity, hard work and respect, and can be proud, both of the fact they are nearly in that elite clubhouse, and how they got there.